Flywheel, or inertia wheel, is any rotating wheel or disk used to store or transfer momentum. It refers to the wheel itself, exclusive of electronics or other associated devices. 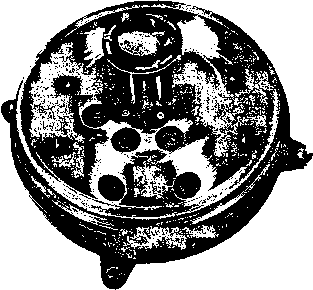 Momentum wheel is a flywheel designed to operate at a biased, or nonzero, momentum. It provides a variable-momentum storage capability about its rotation axis, which is usually fixed in the vehicle. Reaction wheel is a flywheel with a vehicle-fixed axis designed to operate at zero bias. Momentum wheel assembly consists of the flywheel and its associated parts: bearings, torque motors, tachometers, other sensing devices, caging devices for launch, and control electronics. Control moment gyro (CMC), or gyrotorquer, consists of a single- or a double-gimbaled wheel spinning at a constant rate. The gimbal rings allow control of the direction of the flywheel momentum vector in the spacecraft body. The CMG is discussed in Section 6.S. Single Momentum Wheel. The capacity of a typical momentum wheel varies from 0.4 to 40 kg-m2/s. Because the same momentum can be achieved with a small, high-speed flywheel as with a large low-speed one, design tradeoffs generally favor the smaller wheel because of size and weight. Thé high-speed wheel has the disadvantage of greater wear on the bearings, which may shorten its lifetime. As described in Section 6.2, horizon scanners have been incorporated as an integral part of the momentum wheel assembly on several spacecraft. A momentum wheel-horizon scanner combination is shown in Figs. 6-27 and 6-28. Typical values of momentum wheel parameters are given in Table 6-11.